This laboratory manual for allied health or general microbiology has been written with the student in mind. 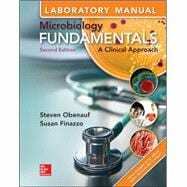 The authors have used their years of teaching microbiology and microbiology laboratory at all levels to identify and relate the fundamental concepts that are important to the understanding of the science and students’ success in their future field. They have included case studies to exemplify the relevance of the science and extensive visual imagery to help students understand and learn the content. Most importantly, the authors hope this manual will help students experience the thrill of bench science and share some of the enthusiasm they have for microbiology, a field of science that is dynamic, exciting and touches every aspect of your life.